About Sweets: Age 32, Secretary by day, Baker by night. FabFit™ Academy Certified Bra Fitter, lover of all things silky and frilly. 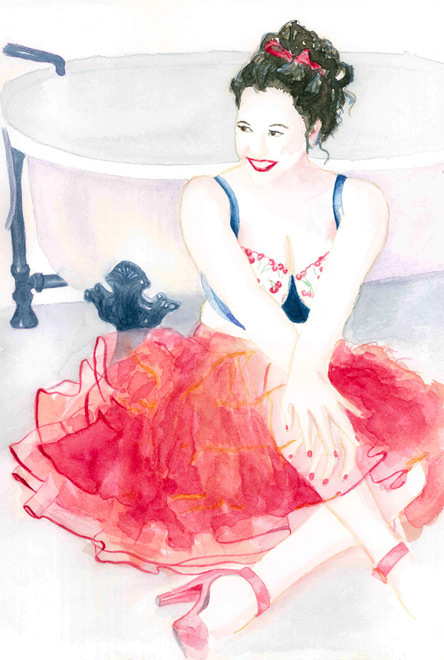 Born out of a desire to share lingerie tips and resources, Sweet Nothings has become a destination for lingerie reviews, bra fitting advice, and editorials covering a range of topics from body image and feminism to ballet and pole dancing. I am dedicated to helping all women find lingerie that fits their individual bodies and makes them feel fantastic, no matter their age or size. I am a certified bra fitter and am available for personal fittings, shopping, and lingerie styling consultations. I have extensive experience fitting full-bust women, and over 16,000 visitors stop by the blog each month for reviews, fit tips, opinion pieces, trend stories, and, yes, okay, also dessert recipes. Do you have a question for me? A request? A comment you’d rather share privately? Use the form below to send me an email or email me at sweetnothingnyc@gmail.com.